Ramon Nunez scored twice as Leeds came from behind to beat Doncaster in the second round of the Carling Cup. The home side were ahead after just two minutes through James Hayter and then dominated the opening half hour. They failed to capitalise though and were made to pay when Nunez fired in an equaliser for the visitors. The second half was more even with both sides having chances, but it was Nunez who had the final say, firing in from 18 yards to win it for Leeds. The Honduras international Nunez was one of six Leeds changes from the Leeds side that drew 2-2 at West Ham on Sunday, and rewarded manager Simon Grayson by taking his season tally to five goals from three starts. Doncaster had made three changes themselves from the weekend, hoping to find some form following a run of four straight league defeats at the start of the season. Initially it paid dividends as the home side began much brighter and seized a second-minute lead when Hayter turned in Giles Barnes' cross. They proceeded to dominate the following 30 minutes but were unable to take advantage, with Kyle Bennett particularly wasteful by hitting the post when through one-on-one with United keeper Paul Rachubka. Leeds punished the home side for such profligacy when Andy Keogh headed on a long-ball which Nunez allowed to bounce before looping a shot in from 20 yards. Rovers began the second half as they had the first but there wastefulness continued with Bennett twice going close with a back-header and then a mis-directed 20-yard drive. Nunez had no such issues at the other end though and with seven minutes remaining he positioned himself on the edge of the box and lashed home a loose ball to give Leeds the lead. Bennett clipped the post again late on, but by then his side's resolve had been broken. 90:00+5:05 The referee blows his whistle to end the game. 90:00+2:41 Max Gradel is adjudged to have handled the ball. James O'Connor restarts play with the free kick. 90:00+2:31 Max Gradel takes a shot. Save by Gary Woods. 90:00+1:14 Free kick awarded for an unfair challenge on James Hayter by Darren O'Dea. Kyle Bennett shoots direct from the free kick. 90:00+0:18 John Oster challenges Jonathan Howson unfairly and gives away a free kick. Paul Rachubka restarts play with the free kick. 89:30 Tommy Spurr sends in a cross, save by Paul Rachubka. 87:31 Shot from outside the area by Kyle Bennett hits the post. 85:25 John Oster restarts play with the free kick, George Friend takes the chance to get an effort at goal. Comfortable save by Paul Rachubka. 85:25 Substitution Brian Stock on for Simon Gillett. 85:25 Max Gradel gives away a free kick for an unfair challenge on Kyle Bennett. 84:38 George Friend takes a shot. Paul Rachubka makes a comfortable save. 82:09 GOAL - Ramon Nunez:Doncaster 1 - 2 Leeds Goal scored by Ramon Nunez from just outside the penalty box to the bottom left corner of the goal. Doncaster 1-2 Leeds. 81:20 Unfair challenge on Max Gradel by Mark Wilson results in a free kick. Direct free kick taken by Darren O'Dea. 80:34 The official flags Max Gradel offside. Free kick taken by Gary Woods. 77:28 Mark Wilson takes a shot from 25 yards. Save by Paul Rachubka. Outswinging corner taken right-footed by Kyle Bennett from the right by-line, free kick awarded for a foul by Mark Wilson on Paul Connolly. Paul Rachubka restarts play with the free kick. 75:56 Max Gradel gives away a free kick for an unfair challenge on James O'Connor. Gary Woods takes the free kick. 75:31 Substitution Andy O'Brien goes off and Patrick Kisnorbo comes on. 73:22 Mark Wilson concedes a free kick for a foul on Andrew Keogh. Andrew Keogh takes the free kick. Outswinging corner taken from the right by-line by Ramon Nunez, clearance made by Sam Hird. Inswinging corner taken right-footed by Max Gradel, Tommy Spurr manages to make a clearance. 70:35 John Oster concedes a free kick for a foul on Andrew Keogh. Free kick taken by Charlie Taylor. The assistant referee flags for offside against Andrew Keogh. Gary Woods takes the free kick. 69:33 Shot from deep inside the area by Max Gradel clears the bar. 69:06 Foul by Ramon Nunez on James O'Connor, free kick awarded. Free kick taken by James O'Connor. 68:10 Free kick taken by Gary Woods. 68:10 Substitution Giles Barnes goes off and Mark Wilson comes on. 68:10 The referee blows for offside. 67:06 Giles Barnes fouled by Jonathan Howson, the ref awards a free kick. Giles Barnes restarts play with the free kick. 66:24 Lloyd Sam challenges Tommy Spurr unfairly and gives away a free kick. Direct free kick taken by Gary Woods. 65:08 Substitution James O'Connor joins the action as a substitute, replacing Richard Naylor. 63:09 Free kick taken by Paul Rachubka. 63:09 Substitution Ross McCormack goes off and Max Gradel comes on. 63:09 The offside flag is raised against James Hayter. 61:49 The ball is delivered by Lloyd Sam, clearance made by George Friend. 61:06 Andrew Keogh has an effort at goal from deep inside the area missing to the right of the target. 58:57 Substitution (Leeds) makes a substitution, with Charlie Taylor coming on for Aidan White. 55:10 Effort from the edge of the penalty box by Ross McCormack goes wide of the right-hand upright. 53:33 Andrew Keogh has a shot on goal from outside the area which misses right. 52:53 Shot by Kyle Bennett from just outside the area goes over the net. 50:53 Kyle Bennett decides to take a short corner, Sam Hird takes a shot. Blocked by Darren O'Dea. Giles Barnes takes a outswinging corner to the near post, Darren O'Dea manages to make a clearance. 48:04 Giles Barnes challenges Zac Thompson unfairly and gives away a free kick. Ramon Nunez crosses the ball from the free kick right-footed from right wing. Foul by Jonathan Howson on James Hayter, free kick awarded. Simon Gillett takes the free kick. 46:41 James Hayter fouled by Darren O'Dea, the ref awards a free kick. Direct free kick taken by Mustapha Dumbuya. Sam Hird sends in a cross, Kyle Bennett takes a shot. Save by Paul Rachubka. 45:00+1:24 The ref blows to signal half-time. 45:00+0:36 Ross McCormack has a shot on goal from outside the box which misses right. 44:25 A cross is delivered by Mustapha Dumbuya, Aidan White gets a block in. 43:10 Ross McCormack is caught offside. Sam Hird takes the indirect free kick. 41:37 Free kick awarded for a foul by Sam Hird on Ross McCormack. Darren O'Dea takes the direct free kick. 39:19 Sam Hird takes a long range shot clearing the crossbar. 38:19 The assistant referee flags for offside against Ross McCormack. Gary Woods restarts play with the free kick. 37:14 Free kick awarded for a foul by Simon Gillett on Jonathan Howson. Free kick taken by Ross McCormack. 36:17 Free kick awarded for an unfair challenge on Giles Barnes by Lloyd Sam. Free kick taken by Giles Barnes. 33:25 The ball is swung over by Aidan White. 31:15 Zac Thompson concedes a free kick for a foul on Giles Barnes. Free kick crossed right-footed by John Oster from right wing, Darren O'Dea manages to make a clearance. 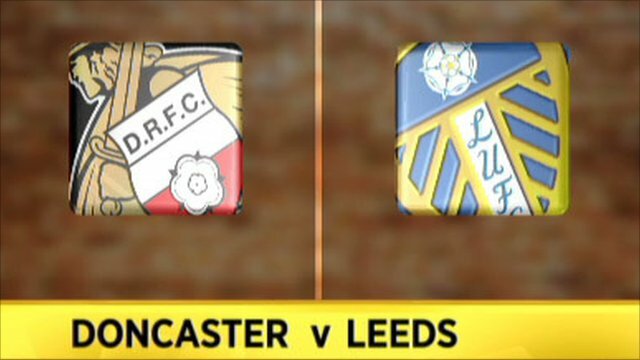 29:31 GOAL - Ramon Nunez:Doncaster 1 - 1 Leeds Ramon Nunez scores a goal from just outside the area to the top left corner of the goal. Doncaster 1-1 Leeds. 27:09 Zac Thompson takes a shot. Giles Barnes gets a block in. Corner taken by Ramon Nunez played to the near post, Tommy Spurr manages to make a clearance. 26:58 The ball is swung over by Lloyd Sam, clearance made by George Friend. 26:24 The offside flag is raised against Kyle Bennett. Paul Rachubka takes the free kick. 23:42 Unfair challenge on George Friend by Andrew Keogh results in a free kick. Free kick taken by Gary Woods. 21:27 Shot by Aidan White from a long way out goes over the crossbar. 20:01 Kyle Bennett produces a drilled right-footed shot from just outside the penalty box that hits the post. 18:57 Free kick awarded for a foul by Simon Gillett on Jonathan Howson. Paul Connolly delivers the ball from the free kick right-footed from right channel, clearance by Giles Barnes. 18:16 Simon Gillett takes a shot. Save made by Paul Rachubka. Giles Barnes takes a outswinging corner from the right by-line to the near post, clearance by Aidan White. 17:38 Kyle Bennett takes a shot. Save made by Paul Rachubka. Giles Barnes decides to take a short corner. 13:27 The assistant referee signals for offside against Ross McCormack. George Friend restarts play with the free kick. 12:13 Giles Barnes takes a shot. Aidan White gets a block in. Outswinging corner taken by Giles Barnes from the right by-line. 10:11 Mustapha Dumbuya produces a cross, Andy O'Brien manages to make a clearance. 8:49 Giles Barnes takes a shot. Blocked by Andy O'Brien. Kyle Bennett decides to take the corner short. 7:38 Giles Barnes produces a cross, Richard Naylor takes a shot. Blocked by Andy O'Brien. Corner taken by John Oster from the left by-line, clearance by Andy O'Brien. 7:38 Booking Aidan White is cautioned by the ref for unsporting behaviour. 7:17 Unfair challenge on Mustapha Dumbuya by Aidan White results in a free kick. 6:44 Andrew Keogh is flagged offside by the assistant referee. Indirect free kick taken by Richard Naylor. 6:12 Kyle Bennett has an effort at goal from outside the penalty area which goes wide right of the goal. 5:06 Andrew Keogh is adjudged to have handled the ball. Gary Woods takes the direct free kick. 1:56 Assist on the goal came from Giles Barnes. 1:56 GOAL - James Hayter:Doncaster 1 - 0 Leeds A goal is scored by James Hayter from inside the six-yard box to the bottom right corner of the goal. Doncaster 1-0 Leeds. 0:23 Free kick awarded for an unfair challenge on Jonathan Howson by Simon Gillett. Ramon Nunez produces a strike on goal direct from the free kick.